Dr. Goldstein will discuss his research, as well as the challenges it has presented and how the Freedman Fellows program provided both solutions and support. 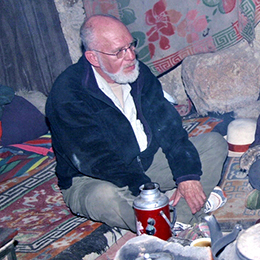 Dr. Goldstein and the Center for Research on Tibet have been collecting and translating oral history interviews and documents relating to modern Tibetan history and society for over three decades. These materials, all of which are part of the Tibet Oral History and Archive Project (TOHAP), are a unique and invaluable primary source on the social and political history of modern Tibet and Sino-Tibetan relations. The collection consists of approximately 1,600 hours of oral interviews with both the “common folk” who lived in villages and towns in traditional Tibet, as well as a large group of in-depth interviews with monks from Drepung, Tibet’s largest monastery. To prepare these interviews for publication in an online archive hosted by the Library of Congress, Dr. Goldstein has been working over the past year to correct TEI-XML syntax errors from this large corpus of data, as well as transcribe Chinese government documents. Encoding the data in TEI increases the availability of this valuable primary resource and expands how it can be used by other scholars in future research. Dr. Leigh Bonds (Digital Research Services Librarian for the Humanities, Kelvin Smith Library) will present with Dr. Goldstein to discuss what TEI is, the connection between encoding and scholarly editing, and its applications in digital humanities work.